We’ve all seen Energy Rating Labels on appliances – but how much do you really know about what they actually mean? While it’s common knowledge that the stars relate to energy efficiency, there’s a lot more to these little symbols than you may have realised. 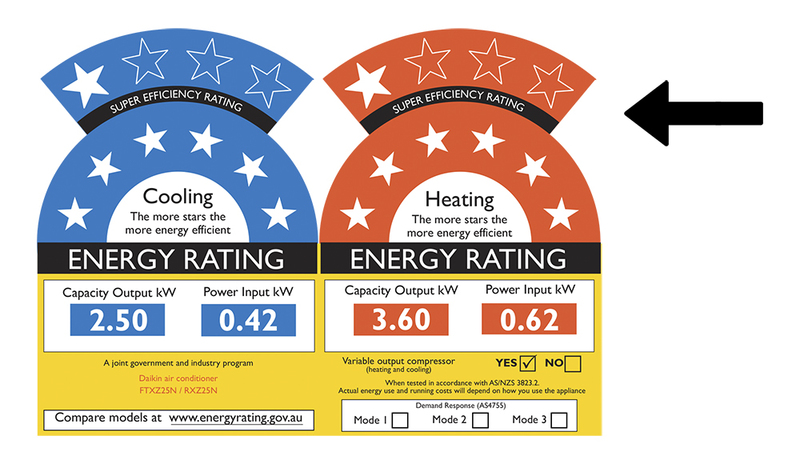 As well as being a mandatory standard in Australia, Energy Rating Labels can actually work as a handy tool to help you make smarter purchasing decisions. Let’s take a closer look at those stars, and what they mean in the context of heating and cooling your home. The stars were born back in the 1980s. First introduced to NSW and VIC in 1986, the Energy Rating Label system has been used in Australia for more than 30 years – however it wasn’t until 1992 that it became mandatory across the country, and regulated by the Australian government. We were one of the first countries in the world to introduce this kind of energy rating system for our electrical products. The idea behind it was to help people understand that not all appliances are equal in terms of their energy use, and increase demand for more efficient products. The star system does vary according to the type of appliance you’re looking at. Energy Rating Labels appear on all sorts of appliances, from air conditioners to fridges, washing machines and dryers. However, it’s important to note that this doesn’t mean you can use the stars to compare different types of appliances – for example, a three-star air conditioner won’t necessary use the same amount of energy as a three-star dryer. What the stars DO allow you to do is compare appliances that are similar in terms of type and size. After all, a smaller appliance will almost always use less energy than a larger one. Air conditioners can be a little harder to read, as there are multiple ratings. Like other appliances, air conditioners are given star ratings for their performance – however there are often two sets of stars to look at: blue stars that rate cooling efficiency, and red stars assess heating. With more stars to take into account, air conditioners can be trickier to select (even once you’ve determined that you’re weighing up similar models). The real key here is to look at both the stars AND the numbers that go with them. There are two numbers you’ll need to look at: Capacity Output kW (which lets you know the amount of cooling and heating the model can produce) and Power Input kW (which tells you how much power it needs to run). These numbers essentially tell you how much bang you’re getting for your energy buck, and they help explain the number of stars a product has earned. How many stars should you settle for? Most products out there are rated between 1 and 6 stars, but as technology is improving, so too is energy efficiency. Now, it is possible for air conditioners to be rated as many as 10 stars, thanks to new ‘Super Efficiency Ratings’ – an additional band of 4 stars that appears when an appliance is extra efficient. So how many stars indicates that a product is efficient enough? Really, it comes down to you. All appliances have to pass rigorous standards and achieve basic levels of energy efficiency to get a label at all – so even those with one star aren’t necessarily bad. When it comes to air conditioning, the model you choose will come down to a range of factors, including the climate you live in, your budget, and the size of the space you’re trying to heat and cool. It’s by no means straight forward, which is why we recommend seeking assistance from one of our Daikin Specialist Dealers who can help you assess, plan and install the right unit for your needs. If you’re keen to up the ante with your energy efficiency, you may be interested in Daikin’s US7 model – currently the only split system in Australia to achieve an astonishing 7-Star Super Efficiency Rating. Previous Post Staff Profile: Esther Shehata Next Post Is it time to replace your Split System?